I really wasn’t sure what to expect from this movie. The critics ripped it to pieces. I think it mostly bombed in the box office. But I thought it looked funny and I tend to like Jack Black’s tamer humor (School of Rock, anyone?). So I was leery. But I ended up really liking it. It was funny, just one joke after another. I loved the way Lilliput was so regal compared to Gulliver. And then he started bringing contemporary culture to it. Very funny combination. I think it’s always fun to see the times clash. Gulliver works in a mailroom, with what appears to be no forward career momentum. On a whim, he takes a job writing a travel piece that leads him into the Bermuda Triangle. When his boat gets sucked into a vortex, he’s dropped on the island of Lilliput, where the people are only 6 inches tall. And for once, Gulliver isn’t a mailroom attendant anymore. Ok, yes. This movie is horrendously corny. But that’s what makes it funny. Jack Black, Jason Segel. That’s what they do. Add the charming Emily Blunt and Amanda Peet and you’re on to something that’s not just raunchy guy humor. Oh, and a totally hunkalicious Irish fella, who seems to be on the right path to being my new eye candy (though maybe not in the outfit he wears in this movie). Isn’t he gorgeous? Chris O’Dowd. He plays a bad guy in this movie, but that’s the first time I’ve seen him in a role like that. He’s so cute…. Ahem. Movie review. Right. So yes, it’s corny. With jokes about Gulliver being Luke Skywalker and nearly everyone else in pop culture, it’s not meant to be taken seriously. So don’t try. If you’re trying to take it seriously, there’s something wrong with you. It’s Jack Black, for heaven’s sake. Just enjoy the movie and drool at the eye candy. Romantic movies. Every girl loves them, particularly this girl. I’ve compiled a list of 15 of my favorite romantic movies based on 5 criteria I listed in the first portion of this list. If you missed it, go back and read it. But basically, it’s how devoted the couple is to each other, how well they work together, and how difficult of hardships they’ve overcome. Ready for the next five? The Story: Anna is the President’s daughter who feels she’s being kept on too short a leash. During an escape from the Secret Service, Anna meets Ben, who goes with her around Europe to make it to Berlin. What Makes Them Amazing: Besides the fact that it’s Mandy Moore (look! I’m not mentioning a guy this time! Though he is really cute…), I love the fact that it’s the President’s daughter who is rebelling. And Ben is such a sweetheart. Even though he believes most of the time that Anna’s being stupid, he follows her from city to city to make sure she’s safe. How cute is that? The Story: Baby is going on vacation with her family to a fancy resort, which is not as fun as she would have hoped. Until she’s shown a different side of Kellerman’s resort. There she meets Johnny Castle, a talented dancer and a man unlike any she’s met before. What Makes Them Amazing: Oh come on. Baby and Johnny are classic! Every girl was like Baby at one point and who doesn’t enjoy watching Patrick Swayze kill on the dancefloor? That last musical number is my favorite. Oh, how I’ve longed to find someone as awesome as Johnny Castle…sigh. 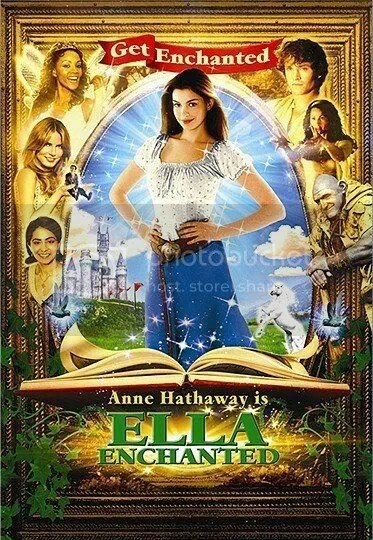 The Story: As a baby, Ella was enchanted (ha!) by a fairy godmother to always obey orders. Ella’s never liked her “gift” and wishes it’d go away. After she’s pushed too far, she goes in search of this godmother and ends up traveling with Prince Charmont, who learns what’s really happening in his kingdom. What Makes It Amazing: It’s a fairytale! Who doesn’t love a good fairytale? Also, there’s killer music. But more on point, I love how Ella loves Char. That curse is one serious obstacle to overcome. And Char’s cute. I had to say it. Who wouldn’t want to find their own prince? As a side note, Cary Elwes (remember him? #15) plays the bad guy in this, which is just awesome. What Makes Them Amazing: This is totally based on a true story. How true it is, I’m not sure. But it did say that Victoria was deeply in love with Albert, which Blunt makes very obvious. And I loved how devoted Albert was to her as well. They overcame so much and Albert gets serious brownie points for his “big gesture” of love. You can’t help but adore a prince like that. The Story: Really, is there anyone who doesn’t know what Pirates is about? And really, I’m only looking at the relationship between Will and Elizabeth when I talk about this. Boy loves girl from afar, girl gets kidnapped, boy tries to save girl, girl falls in love with boy. What Makes Them Amazing: Trust me, I’m still looking at this going, “This made it all the way up to #6?” The only thing I can think of that helped it along is the fact that I’m in love with England and this era (as if you couldn’t tell by the list thus far). Oh well. I love that Will is do devoted to Elizabeth, even from the beginning. I love that they make such a great team, which probably earned them high marks for compatibility. That’s it for now, guys. The last 5 movies in this list will be coming! I wouldn’t leave you hanging, now would I? Don’t worry, we’re almost there!